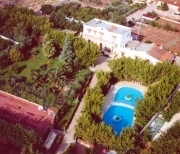 The Holiday Residence hotel is situated 18 km from Bari. The property is just a few minutes from Turi/Casamassima, famous for its delicious cherries and is the ideal place for excursions in the Apulia. Holiday Residence is 10 minutes from Castellana Grotte, 20 minutes from Alberobello and from the sea, 30 minutes from Fasano/Ostuni, 40 minutes from Castel del Monte/Matera, near to Il Baricentro, golf course Bari Alto and commercial center Auchan of Casamassima). We advise you to come with a car, because it is difficult to use the public means or taxi, and is also difficult to arrive to touristic places without car. Most of you will easly travel in this region you will surely find fantastic. At Holiday Residence, nature meets tradition, in an old rural structure dating back to the XVI century. The property offers various facilities such as mini apartment with two rooms, kitchenette, safe, bath room and private terrace , the guests can choose to have the third and fourth bed in the same room or in the other room. On the residence available bar, restaurant, mini golf or tennis courts, swimming pool, open-air dance floor, reading room, meeting room, satellite television , a chapel, gazebos, internet by free-hotspot etc.etc. Arrival by car: Highway no. A14, exit at Bari Nord (Distance km 25,00), (Or from airport Bari-Palese, about 30 km) Follow for Bari at the bypass road (Tangenziale) take direction of Brindisi-Lecce. Go out at exit 13/B "Taranto", you are on S.S. 100 Bari-Taranto follow for 15 km and after the exit of the Trade Centre "Auchan" (on your left), without entering in Casamassima, take the exit Casamassima-Conversano and continue for Conversano (S.P. 65) for 3 km. Turn on the right at the first asphalted road and follow the signal for Holiday Residence.